A great example of "Hey, let's not leave ANYTHING out!" cabinet design, also found in Toshiba's 7TP-303 "Cat's Eye." Both are memorable, the Toshiba for being quite dopey looking, and the Zephyr 930 for being so stunning in appearance. The Toshiba 7TP-303 pastes a big, gold "7" (for 7 transistors!) in the middle of it's speaker grill, almost like an afterthought. 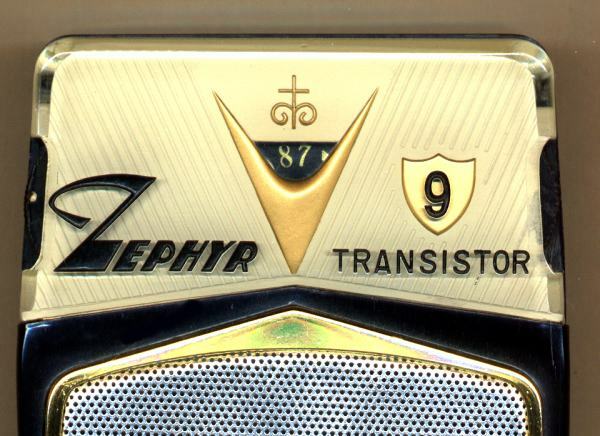 The Zephyr has its "9" for 9 transistor as part of the reverse-painted plastic, and inside a gold badge that mimics the shape of the speaker grill. True, the Zephyr does have some weirdness going on, like that curlicue cross thingy above the tuning dial, but at least it's tiny -- unlike, say, a giant gold relief chevron plastered onto an exactly-square speaker grill (I'm not naming names here, but the initials of such a radio are "Cat's Eye"). And where the Toshiba Cat's Eye cabinet is as hard and angular as a brick, the Zephyr's cabinet angles are contoured -- as if the Zephyr were meant to be held in a person's hand. The Zephyr 930's reverse-painted dial plate shares a feature common to many Zephyrs and Globals -- the combinination of surface stamping with underpainting. The words, "ZEPHYR" and "TRANSISTOR" and the numeral "9" are stamped on the outside surface of the acrylic plate and then filled in with paint. The rest of the dial plate is underpainted. The 930 cabinet also came in red.